KOKOMO, Ind. — Indiana University Kokomo student Alexis Martin received more than double the scholarship she expected at the Indianapolis Star's Salute to Nurses awards luncheon Wednesday (April 25). 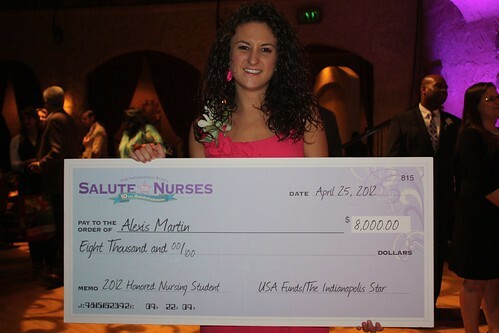 As the Honored Nursing Student winner, Martin thought her award would be for $3,500. She was shocked, then, to receive a check for $8,000. "Nothing like this has ever happened to me before," she said. "I am so grateful to the faculty in the IU Kokomo School of Nursing for seeing something in me I didn't see, and nominating me for this award." Chancellor Michael Harris congratulated Martin on her accomplishment. "We are proud of Alexis for receiving this statewide honor," he said. "This demonstrates the quality of the academic programs at IU Kokomo, as well as the quality of our students. I have had several opportunities to get to know Alexis, and she is certainly worthy of this award." Martin, a junior, was the only nursing student honored at the annual awards lunch, at the Indiana Roof Ballroom in downtown Indianapolis. The program also included presentation of the Nurse of the Year award. Winners will be featured in Star Media's Indiana Nursing magazine. Carrie Bernhardt, events manager for Star Media, said nursing programs statewide nominate one student each for the Honored Nursing Student award. Representatives from the Indiana State Board of Nursing chose Martin from her nomination and essay about why she wants to be a nurse. Bernhardt said the newspaper provides a $3,500 scholarship, and USA Funds gave an additional $4,500. "This is the first time we've ever had a donor more than match our scholarship," she said. "We are pleased to be able to honor Alexis with a substantially larger scholarship than she expected. It was hard to keep this news to ourselves." Linda Wallace, dean of the School of Nursing, said faculty chose Martin for her work ethic, positive attitude, and her heroic actions after witnessing a car accident on her way to a clinical experience in January. As Martin approached the site of the accident, she found one woman seriously injured and trapped in her car. She immediately assessed the situation, attended to the woman's injuries, and provided support until medical care arrived. Wallace said nursing faculty are proud that Martin used the skills she learned in her nursing classes.